Ma ry McLaughlin was interviewed recently by Jerome McDonnell on “World View” on his Global Activism segment on National Public Radio. Mary talked about Trees That Feed activities and accomplishments. She sounded like a pro! 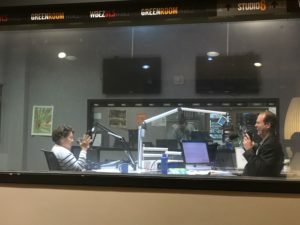 Click here to go to WBEZ’s Worldview page, to listen to the full interview! This entry was posted in Blog, Press Release, Recent News. Bookmark the permalink. Solar Dryer Engineering Drawings Ready! Michael McLaughlin on Solar Dryer Engineering Drawings Ready! Michael McLaughlin on Jamaica Research Project Completed! ©2019. A 501(c)(3) not-for-profit organization. Donations are fully tax-deductible to the extent allowable by law.